I am an American musician, conductor and educator who conducts bands, orchestras, jazz ensembles, opera, and musical theater. 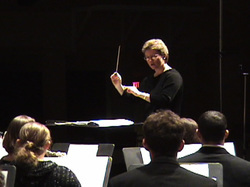 I've worked with professional, college, university, military, school and amateur ensembles. Take a moment to browse - you can read about my work, listen to live performances, view the photo gallery, and ask me a question or request more information.